Combining the best characteristics of TOP GRIP and SOLID models. 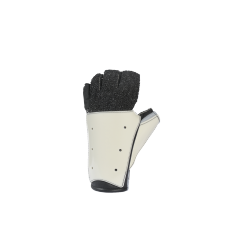 Specially developed for modern standing positions: When the shooter keeps the rifle on the fist or on the palm in the standing position – the most commonly used positions adopted by World Champions, see pictures. 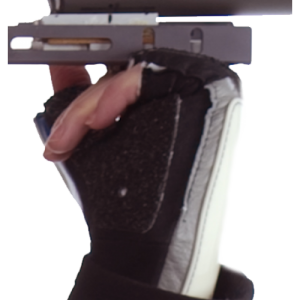 The back consists of stable SOLID material, supporting the wrist in standing and reducing the pressure of the shooting sling in prone/kneeling. 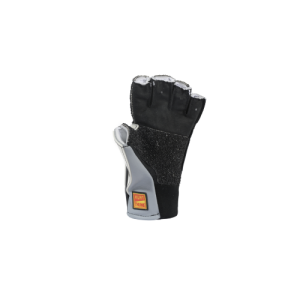 In standing when supporting the rifle on the fist the TOP GRIP on the back of the fingers provides a high friction support area for the rifle. The TOP GRIP on the palm does the same work when keeping the rifle on the palm. Short fingers, sizes: XS, S, M, L, XL, XXL. Black side Solid, palm + fingers Top Grip (pat).